Junior Izzy Carroll scored 16 points, all in the second half, and grabbed 11 rebounds to help the Platteville Hillmen defeat the host Lancaster Flying Arrows 52–44 Friday night. 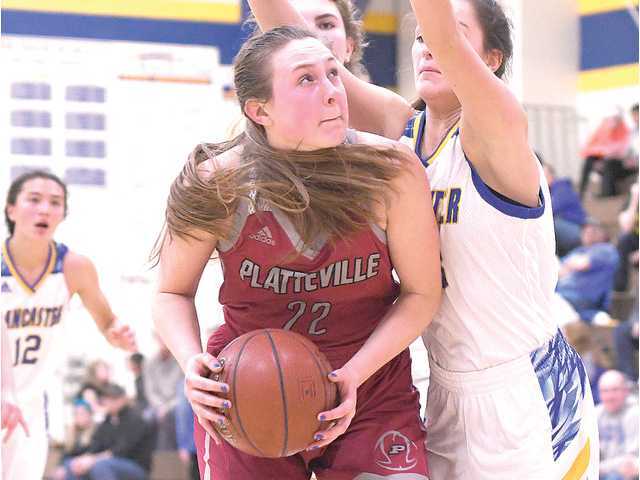 POSTED December 6, 2018 11:13 a.m.
LANCASTER — Izzy Carroll is going to play a much larger role for this year’s Platteville girls basketball team. The junior volleyball standout was a part-time starter a year ago on the hardwood after missing most of her freshman year with an injury. Friday night Carroll put the Hillmen on her back and carried them to a narrow 52–44 victory at Lancaster in the Southwest Wisconsin Conference opener for both teams. Carroll scored all of her points — a career-high 16 — in the second half and grabbed 11 rebounds to stave off a Flying Arrow comeback. Platteville, ranked fourth in the latest Division 3 coaches poll, raced out to a 13–4 lead just seven minutes into the game behind six quick points from sophomore center Sami Martin and five from classmate Becca Hoyer. But Lancaster (4–1, 0–1 SWC) switch to a 2–3 zone to limit Martin’s touches in the paint and Hoyer’s drives to the basket. The Arrows forced the Hillmen to shoot from the perimeter and held Platteville to just eight points the rest of the half to claw within six at intermission, 21–15. Senior point guard Lydia Murphy scored 10 of her team-high 20 points in each half to lead the comeback. Carroll scored back-to-back baskets early in the second half and Hoyer tacked on a leak out basket to push the lead back to 10 at 33–23 after Lancaster cut the lead to four. The Flying Arrows then put together an 11–2 spurt, capped by senior Devin Wagner’s layup with 6:40 remaining to make it a two-point game at 39–37. Martin, who finished with a 16 points and a game-high 15 points for the Hillmen, scored in the paint on the ensuing possession. The Carroll went back to work scoring Platteville’s next seven points on a free throw and three baskets in the paint to make it 50–42 with just 47 seconds left. After a Lancaster miss, Martin made a pair from the line with 17.7 remaining to close out the win on a night where Platteville shot just 35.4 percent from the field, including just 1 of 15 from behind the 3-point line. Hoyer finished with 11 points and four rebounds. Junior Josie Nies added five points, six rebounds, six assists and four steals. Monday night, the Hillmen (3–1, 1–0 SWC) suffered their first loss of the season, a 42–39 non-conference loss to Black Hawk, the top-ranked team in Division 5. Black Hawk (4–0) jumped out to a 31–18 half time lead as Division 1 recruit Bailey Butler scored 16 of her game-high 20 points in the first half. Platteville battled back in the final 18 minutes outscoring the Warriors 21–11 in the second half. Nies drilled a 3-pointer with 2.5 seconds to play to make a 3-point game and Platteville forced a turnover on the ensuing possession. The Hillmen had the ball with a chance to tie, however, they were not able to get a shot off. After being outscored by 13 in the first half, the Hillmen held the high-scoring Warriors to just three made field goals in the second half. “I am proud of the girls the way they played defense against Black Hawk in the second half,” added Foley. “The girls gave up too many open looks in the first half and Black Hawk converted on them. In the second half, the girls played with more intensity on defense and were successful. “We need to put two halves together. We came out flat in the first half and we outplayed them in the second half. We have to all believe in team defense and be in the right defensive alignment that allows for players to be able to help on the weak side. Offensively, we can play better. We needed to convert on a few possessions that would allow us a better outcome. I feel that in the second half we played with more confidence and together as a team. Hoyer led the Hillmen with 13 points and six rebounds. Martin posted a double–double of 10 points and 15 rebounds, while Nies added seven points, five rebounds and three assists. Platteville opened last week with a 56–42 comeback victory over visiting Darlington. The Redbirds left with 15 minutes left, but the Hillmen closed the game on a 26–11 run to pull away. Martin finished with 19 points and 10 rebounds. Carroll had 13 points and four steals, and Nies posted 10 points, six assists and five rebounds. The Hillmen will host Richland Center on Thursday night. Darlington (2–1) — Brenna McDonald 5, Bethany McDonald 5, Marissa Gould 1, Lizzie Schwartz 2, Casey Glendenning 4, Reagan Crist 6, Kaylee Meyers 19. Totals 13 12-14 42. Platteville (2–0) — Becca Hoyer 8, Courtney Budden 2, Josie Nies 10, Sami Martin 19, Izzy Carroll 13, Allison Cooley 2, Kaycie Wagner 2. Totals – 20-54 13-20 56. 3-point goals — D: 4 (Be. McDonald 1, Meyers 3); P: 3 (Nies 2, Carroll 1). Total fouls — D: 19, P: 17. Fouled out — none. Platteville (3–0, 1–0) — Becca Hoyer 11, Courtney Budden 4, Josie Nies 5, Sami Martin 16, Izzy Carroll 16. Totals – 23-65 5-12 52. Lancaster (3–1, 0–1) — Bridee Burks 2, Lydia Murphy 20, Morgan DeBuhr 2, Kiley Kelley 5, Brooklyn Connelly 3, Devin Wagner 9. Totals 15 6-13 44. 3-point goals — P: 1 (Hoyer 1); L: 5 (Murphy 3, Connelly 1, Wagner 1). Total fouls — P: 16, L: 15. Fouled out — P: Hoyer. Black Hawk (4–0) — Bailey Butler 20, Hannah Butler 8, Natalie Leuzinger 10, Maddy Huschitt 4. Totals 14 9-15 42. Platteville (3–1) — Becca Hoyer 13, Josie Nies 7, Sami Martin 10, Izzy Carroll 5, Kaycie Wagner 4. Totals – 12-37 14-21 42. 3-point goals — BH: 5 (B. Butler 4, Leuzinger 1); P: 1 (Nies 1). Total fouls — BH: 16, P: 17. Fouled out — none.